“ I wanted to share my story beyond my family and friends, so more people would know about how amazing the bio-super-food is! After a relative of mine had unbelievable results with his serious blood disorder, I had to contact bioage and find out more about the f3. I was glad to learn that it could help me with my hypothyroid, digestive issues, hormones etc… and also be used as a “multi vitamin” for my husband and kids. Within one week my digestive issues were gone, which made me even more confident that I could actually get off my thyroid medication( I was taking armourthyroid, one grain daily). I gradually decreased the armourthyroid until I was completely medicine free, and have been for over a year now! I am forever grateful for restoring my health and for completely eliminating our family’s need for a pantry full of different vitamin bottles. I am now feeling better than ever, and my recent blood/urine tests confirmed it again with their perfect results. My husband and kids are also enjoying optimal health these days. My son’s acid reflux is gone and all our immune systems seem to have benefited tremendeously: we never get sick anymore! In the context of The Martial Art of Wellness, I share selected information about fats, specifically about the essential fats, the Essential Fatty Acids (EFA) in the hope to empower you in making better decision and free you from the hype and marketing claims about many EFA sources or supplements. Yet, of the 50 or more essential elements each of us must get frequently to be healthy, I feel that essential fatty acids are such an important topic that I should share the broader picture about it. There is too much marketing pushing you to purchase fish oils for its Omega 3. I will stress the importance of acquiring your EFA from a diversity of foods containing them, not just from fish or fish oil. Essential Fatty Acids (EFA) are necessary fats that we cannot synthesize, and must obtain from our diet. EFA’s are long-chain polyunsaturated fatty acids derived from linolenic, linoleic, and oleic acids. There are two families of EFA’s that are essential. The first is omega 6, which is called linoleic acid (LA). The second, known as omega 3, is called alpha-linolenic acid (LNA), or super-unsaturated. LA and its derivatives belong to the omega 6 family of polyunsaturated. In addition to linoleic acid (LA), this family includes gamma-linoleic acid (GLA), and dihomogamma-linolenic acid (DGLA). If LA is provided by foods, our cells make GLA, and DGLA. Bad fats (margarines, shortenings, trans-fatty acids, hard fats, sugar and cholesterol), lack of minerals (magnesium, selenium, zinc) and vitamins (B3, B6, C, E), viruses, obesity, diabetes, aging, and rare genetic mutations can all inhibit omega 6 and GLA conversion. DGLA is found in mother’s milk. LNA and its derivatives belong to an omega 3 family of superunstaurates. If LNA is provided by foods, our cells make SDA, EPA and DHA. When the conversion of EFA’s to their derivatives is inhibited by the factors listed above, DHA from algae, evening primrose, borage, and black currant seed and oil. We must obtain adequate supply from food. Deficiency results in gradual deterioration of cells and tissues, and can ultimately result in death. Increasing their intake to adequate levels reverses the signs brought about by deficiency. As structural components of membranes, EFA’s help form a barrier that keeps foreign molecules, viruses, yeasts, fungi, and bacteria outside of cells, and keeps the cell’s proteins, enzymes, genetic material, and organelles (small organs) inside. They also help regulate the traffic of substances in and out of our cells via protein channels, pumps, and other mechanisms. They perform similar functions in membranes that surround organelles within our cells. Determining fluidity and chemical reactivity of membranes. Increasing oxidation rate, metabolic rate, and energy levels. Regulate oxygen use, electron transport, and energy production-our cells’ most important moment-to-moment processes. Stimulate juice-producing (exocrine) and hormone-producing (endocrine) glands. Are precursors of prostaglandins (PGs), three families of short lived, hormone-like substances that regulate blood pressure, platelet stickiness, and kidney function. A delicate balance between PGs with opposing functions, in part determined by omega 6 and omega 3 intakes, determines the health of our cardiovascular system. Are precursors of derivatives like DHA, which are needed by the most active tissues-brain, retina, adrenal, and testes. EFA deficiency is common in the United States, particularly Omega-3 deficiency. The minimum healthy intake for both linolenic (Omega-3) and linoleic (Omega-6) acid via diet, per adult per day, is 1.5 grams of each. One tablespoon of flaxseed oil can provide this amount, or larger amounts of other linolenic-rich foods. Omega-3 deficiencies are linked to decreased memory and mental abilities, tingling sensation of the nerves, poor vision, increased tendency to form blood clots, diminished immune function, increased triglycerides and “bad” cholesterol (LDL) levels, impaired membrane function, hypertension, irregular heartbeat, learning disorders, menopausal discomfort, itchiness on the front of the lower leg(s), and growth retardation in infants, children, and pregnant women. Found in so many foods and not just in fish! Alpha-Linolenic Acid (Omega 3 family) can be found in Flaxseed oil (flaxseed oil has the highest linolenic content of any food), flaxseeds, flaxseed meal, hempseed oil, hempseeds, walnuts, pumpkin seeds, walnut oil, Brazil nuts, sesame seeds, avocados, mustard seeds, some dark leafy green vegetables (kale, spinach, purslane, mustard greens, collards, etc. ), canola oil (cold-pressed and unrefined), grains, soybean oil, wheat germ oil, salmon, mackerel, sardines, anchovies, albacore tuna, algae and others. A healthy human with good nutrition will convert linoleic acid into gamma linolenic acid (GLA), which will later by synthesized, with EPA from the Omega-3 group, into eicosanoids. 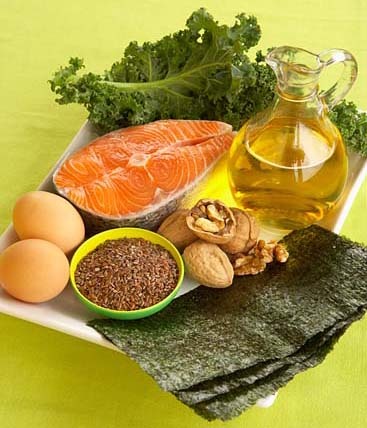 Some Omega-6 are known to improve diabetic neuropathy, rheumatoid arthritis, PMS, skin disorders (e.g. psoriasis and eczema), and aid in cancer treatment. Although most Americans obtain an excess of linoleic acid, it may often not be converted to GLA because of metabolic problems caused by diets rich in sugar, alcohol, or trans fats from processed foods, as well as smoking, pollution, stress, aging, viral infections, and other illnesses such as diabetes. Linoleic Acid, the primary Omega-6 fatty acid is found in many foods, not just fish! Flaxseed oil, flaxseeds, flaxseed meal, hempseed oil, hempseeds, grape seed oil, pumpkin seeds, pine nuts, pistachio nuts, sunflower seeds (raw), olive oil, olives, borage oil, evening primrose oil, black currant seed oil, chestnut oil, chicken, fruits, grains, algae, among many others. Essential but technically not an EFA, because the human body can manufacture a limited amount, provided essential EFAs are present. 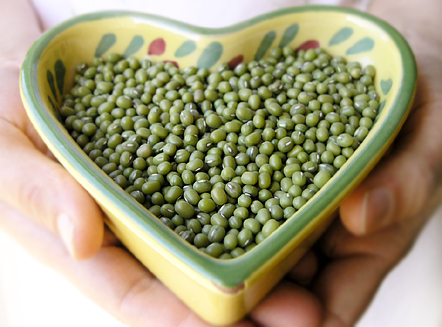 Monounsaturated oleic acid lowers heart attack risk and arteriosclerosis, and aids in cancer prevention. Olive oil (extra virgin or virgin), olives, avocados, almonds, peanuts, sesame oil, pecans, pistachio nuts, cashews, hazelnuts, macadamia nuts, algae, etc. One to two tablespoons of extra virgin or virgin olive oil daily provides sufficient oleic acid for adults. However, the “time-released” effects of eating nuts, grains and other whole foods is more beneficial than consuming a single oil dose. Healing fats, those containing unspoiled EFA’s , are vital to health. Both EFA’s must be obtained from foods in an appropriate ratio. Hard, hydrogenated, and overheated (killer) fats interfere with vital EFA functions. To unfold their health benefits, EFA’s must be fresh, protected from destruction by light, oxygen, and heat, and accompanied by the minerals and vitamins required for their metabolism in the body. Overheating, refining, and hydrogenation destroy EFA’s and their value to human health. An adequate supply of healing fats is even more important to health than the avoidance of killer fats. For salads, replace supermarket salad oil with flaxseed and/or virgin olive oil. Keep flaxseed oil used for dietary supplementation in the refrigerator or freezer, and purchased from a supplier who refrigerates the liquid as well. In nature’s package, EFA-rich oils keep for years without spoiling. Out of that package, light, air, and heat attack EFA’s . Like perishable produce, EFA-rich oils should be made with care and obtained fresh. Frying and deep-frying destroy EFA’s by the combined effects of light, oxygen, and heat, producing toxic substances that produce atherosclerosis and cancer. EFA-rich oils should be made and packaged in the absence of light, oxygen, and heat. Frozen solid (which does not damage them), oils remain unspoiled for a long time. Manufacturers should ship them directly to retailers or consumers without stops along the way. Choose flax oils over fish oil – In his book, Dr. Rudin (see below) points out that most Omega-3 studies are based on fish oil. Rudin finds this disappointing, as he has had better results with flaxseed oil in his own studies. This may be because flaxseed oil starts with the plant form of linolenic acid, ALA (alpha linolenic acid), whereas fish oil contains the animal form, DHA (docosahexaenoic acid). Note that fish require only one fatty acid and plants require neither-they make EFA’s. The human body makes its own DHA and EPA (eicosapentaenoic acid) from ALA. Although the amount of DHA made is small, the body doesn’t need much. DHA is contained in cell membranes, and is held there with little replacement. In contrast, ALA and compounds made from it are also needed in the body for a number of essential functions. Fish oil cannot provide ALA, and may deprive you of this critical compound. If you feel the need for DHA or EPA as a supplement, there are enough sources and data covering the different types of oil to indicate that plant-based Omega-3s, or ALA, is the better choice. Flaxseed oil may well be the highest and most practical Omega-3 food known, with only one tablespoon per day providing enough Omega-3 fatty acids for a slightly overweight adult, although “time-released” effects of consuming nuts and other linolenic-rich foods is considered more beneficial than a once-daily oil intake. Most Americans get plenty of Omega-6 fatty acid, the other essential fatty acid that the body can’t manufacture on its own, but often this is of low quality, for example from food cooked in vegetable oil. From Omega-3 and Omega-6 fatty acids, the body manufactures other fats and compounds such as Omega-9, EPA, and DHA (the animal form of Omega-3 found in certain fish oils). Avoid refined and hydrogenated versions of these foods containing EFA; Corn, safflower, sunflower, soybean, and cottonseed oils are also sources of linoleic acid, but are refined and may be nutrient-deficient as sold in stores. High heat, light, and oxygen destroy EFAs, so when consuming foods for their EFA content, try to avoid cooked or heated forms. For example, raw nuts are a better source than roasted nuts. Don’t use flaxseed oil for cooking, and never re-use any type of oil. Extra virgin olive oil or grape seed oil are best to use for cooking oil, as they withstand high heat well. Sprinkling flaxseed meal on vegetables adds a slightly nutty taste. Whole flaxseeds are usually passed through the intestine, absorbing water only and not yielding much oil. Also, its best not to use huge amounts of flaxseed in its meal (ground seed) form, as it contains phytoestrogens. The oil is much lower in phytoestrogens. Donald Rudin, MD, and Clara Felix. Omega-3 Oils; A practical Guide. US: Avery, 1996. Andrew L. Stoll, MD. The Omega-3 Connection. New York: Fireside, 2001.